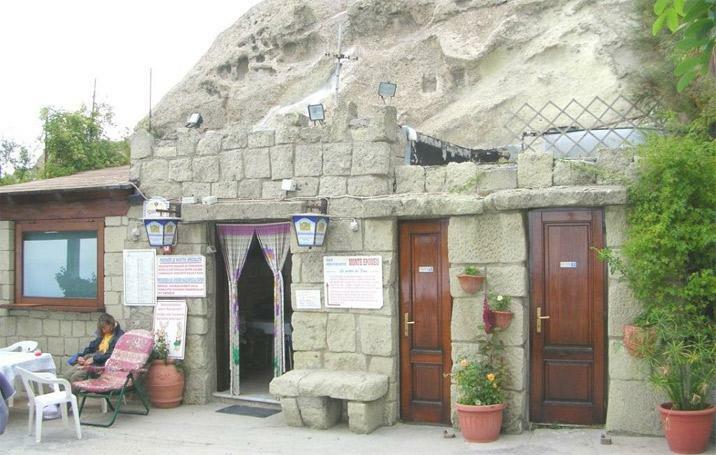 On the top of the island of Ischia, the Monte Epomeo, with a view of Capri and the islands of Ponza, dug into the rock, there is the restaurant "La Grotta di Fiore e Maria". At the restaurant you can taste the local specialities like the rabbit stewed in a tomato, wine and herb sauce, with very good side dishes and wines. The restaurant is open at lunch on request, at the night don't forget to admire the splendid sunshine and sunset. In this place of extraordinary and wild beauty, it's possible to eat local dishes of the island like bruschetta, pork ham, goat cheese, pork underbelly, chips and famous rabbit hole and very good salads with land vegetables and finally a good wine prepared by the Trofa sisters. The restaurant is located on the summit of Monte Epomeo, the most high part of the island of Ischia, 789 m above the sea level. The local derives from a tuff rock called 'La Grotta'. The restaurant is reachable only on foot through a mountain path, if you have car, let it at the parking, follow the directions to the summit, 15 minutes on foot. If you choose the bus, from the suburb of Fontana, through a path, follow the directions to the mountain, 2 km and 35 minutes on foot. Other paths link the summit to the restaurant, to 'pietra dell'acqua' and falanga, marked for excursionists and mountain keens.